We are all looking for the luxury we cannot afford. Precisely for this, Deluxewristwatch.com brings us the opulence and beauty of expensive designer watches at decent prices and promises to provide outstanding quality for all of its replica watches. At first glance, Deluxewristwatch.com seems like a pretty complex online store. It uses an extremely wide layout trying to look modern and stylish. Its basic design is actually a very simple one, gentle on the eye and appealing to any first time visitor. The webpage has a black and white color scheme, a plain and wide upper side menu bar, large sliding banners in the center and pictures of sponsored products in the bottom. Everything is carefully organized and, frankly, very inviting. You do not have to be a skilled person to easily browse through this e-shop. It is quite user friendly and intuitive. In all ways, it looks like a professional online replica store! 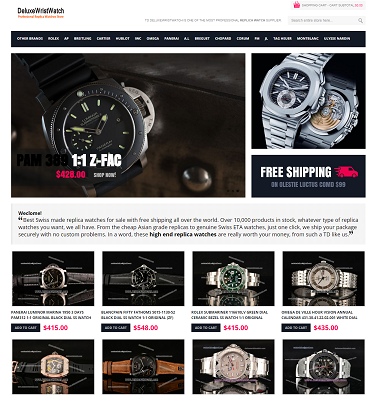 Deluxewristwatch.com features a very large selection of famous watch companies. The top side menu bar tries the impossible: to include all of them. The most important brands are listed in the main buttons while the remaining ones are included in an “Other Brands” button. What I like most about this menu is the fact that when you roll the cursor over a button, you see how a drop down list appears with the sub-categories available for that specific brand. This very little detail determines you to click on a collection and start your shopping spree at once. Not only this company has numerous watch names available, but it also lists hundreds of different models for each brand. The diversity is impressive and represents one of the strong qualities of this store. Also, the replica watches are very well organized into sub-collections. Furthermore, the website offers you the chance to choose the number of products you want to see per page, and to sort them by name or price. But the best part is the Advanced Search bar placed in the left side of the page. It offers the possibility of sorting the replicas by Category, Price, Case or Bracelet. Deluxewristwatches.com has both affordable and expensive replica watches. Of course, the affordable ones are the replicas that are equipped with a Japanese mechanism and these watches cost about $100-$300. The Swiss ones are more expensive and even though some are $300-$600, there are others that cost $700-$1000. It all comes down to how much you are prepared to spend on these imitation timepieces. The delivery for orders over $99 is free, but this implies that your package will be delivered by Registered Mail which is quite slow. It will take about 14-28 days for your order to arrive. If you prefer a faster shipping option then you can choose EMS for $13 which takes about 7-10 business days or Fedex/DHL/UPS for $35 to have your replicas in 5-7 business days. Of course, all packages are shipped with a tracking number, regardless of the shipping company used to dispatch them. The most important thing is that the company has policies that protect your purchase from the very unfortunate event of “custom seizure” or “product arrived damaged”. Deluxewristwatch.com provides a 6 months warranty for all its replica watches. The shipping back must be paid by the customer and the company will cover the delivery costs of sending the repaired watch, as long as it is less than $20. If there is any difference then you will be charged for it. A refund can also be issued, but it does not say within how many days you must send it back. It only says that the watch must not be used. If you send it used then the company will either refuse to issue the refund or charge a restocking fee of $25 from the refund amount. If you receive a wrong product, they will pay all the return shipping costs involved and send you the correct one. The product description page isn’t that obvious. The only thing you see when it loads is a quite vague two-sentence presentation, and only if you are inspired to click on the “Additional Information” button you see the technical details of the replica: movement, materials, size and other design particularities. This online replica merchant claims to accept credit card, bank transfer, PayPal (only for regular/returning customers), Western Union & MoneyGram. Still, what happens when you try to submit an order? What payment options are you really offered? The order form gives you six possibilities. I find this unnecessarily over-complicated. Four of these options are for Visa and Mastercard, just the maximum amount varies. The other two are for Western Union and Bank Transfer. Pictures: The product pictures are gorgeous. These look incredibly professional, worthy of any original brand watch, but you can clearly see that they were made in a particularly unique style and represent very well made replicas, replicas that look very authentic. All the photos have the same black background, show the watches in the same positions, and illustrate the same parts, details and markings of these imitations. The clarity is outstanding and the attention paid when making this pictures show how professional and dedicated this company is when it comes to the quality of its products. Customer service: No matter how professional a company may look, how good its products may appear to be, or how low its prices are, if the customer service is bad or inexistent then it will never convince me to buy its replicas. Deluxewristwatch.com has many of the qualities of a professional replica store, but its customer service is very superficial. When you dial its Chinese phone number no one answers it, the Live Chat shows a message saying that the site administrator needs to set up the account so it can be functional and the contact email address is an unprofessional Gmail account. Summary: Deluxewristwatch.com represents one of the online replica watches stores that create the impression of a very professional company. It is actually quite close of being the perfect fake watches website. It has the looks, the prices and the policies that convince you of this, but it has one huge flaw: it does not provide a responsive and liable customer service. This is one of the most important services a replica company must offer to its customers, one that cannot be overlooked.